Wild-caught Salmon with roasted garlic & butter. 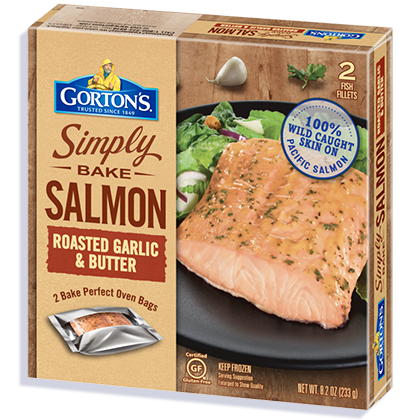 Place the Bake Perfect Oven Bag in your oven and expect restaurant-quality flavor from our Simply Bake Salmon, every single time. With no prep and no mess involved, the legends are true: dinner tonight can be both delicious and hassle-free. *FULLY COOK FISH TO AN INTERNAL TEMPERATURE OF 145ºF OR HIGHER BEFORE SERVING. Salmon, sodium tripolyphosphate (to retain fish moisture). Water, canola oil, sea salt, garlic powder, corn starch, butter (cream, salt), spices, natural flavor, maltodextrin, nonfat milk, citric acid, colored with turmeric and annatto extracts, parsley, xanthan gum. Not a significant source of dietary fiber, vitamin A, vitamin C, and calcium. 315mg EPA and DHA Omega-3 fatty acids per serving.